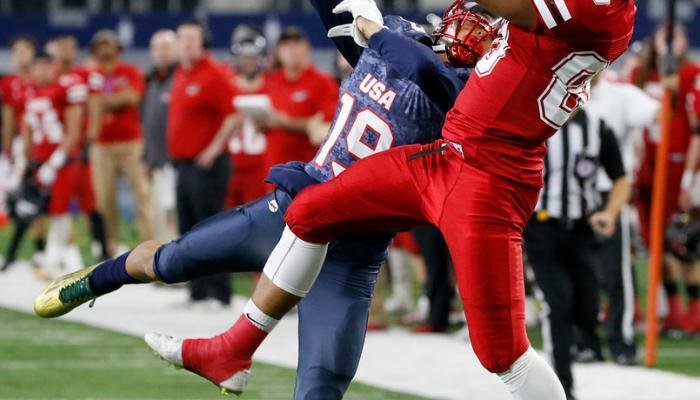 The U.S. National Team is comprised of some of the best high school players in the country. These players have been chosen not only for their talent, but for their leadership and character on and off the field. Take a look at the top 5 players to look out for at this year’s bowl. With two days of games and the opportunity to see the action from the sideline, tickets are going fast! Get your tickets now and get ready for the biggest international high school football competition in the nation. Kickoff is at 10:00 a.m. on January 16th! See the biggest and brightest talent in the nation represent the United States at the 2017 International Bowl. You can also watch all of this year’s games on our livestream with ESPN3. Stay up to date on the latest International Bowl news and join the conversation! Follow USA Football and countdown with us. DON’T WASTE ANOTHER MINUTE! Get your tickets: www.internationalbowl.com.